Place the mint leaves, lime leaves, chilli, fish sauce, sugar and oil in a food processor and process until finely chopped. Remove half the mixture and set aside. Add the lemongrass to the food processor and process until finely chopped. Place the lemongrass mixture in a large bowl. Add the spatchcocks, salt and pepper, and toss well to coat. Set aside for 10 minutes to marinate. While the spatchcocks are marinating, preheat the barbecue (or char-grill pan) to medium. Thread skewers through the spatchcocks and place on the barbecue, breast-side up. Cover with a lid (or a metal bowl, if using a char-grill plate) and cook for 12–14 minutes or until dark golden brown on the bottom. Turn, cover, and cook for a further 5–6 minutes or until dark golden brown and cooked through. 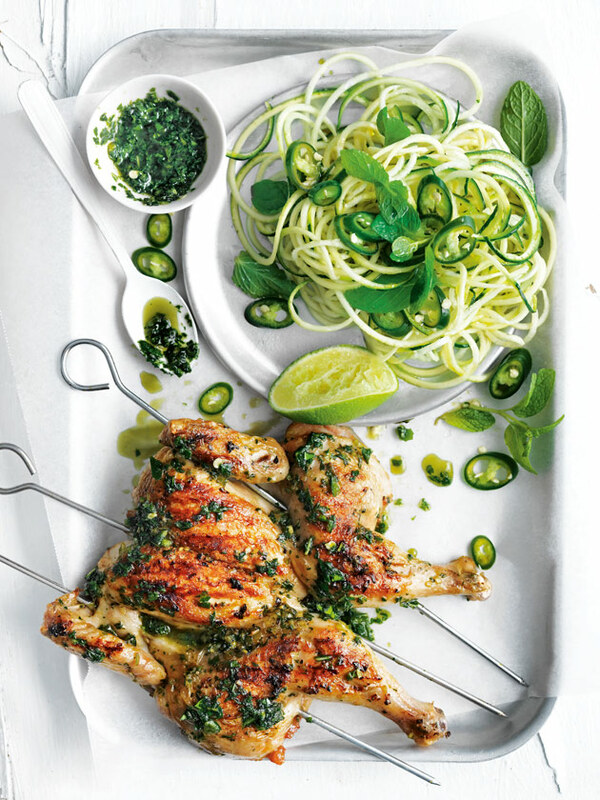 Serve with the zucchini noodles, extra mint and chilli, reserved mint dressing and lime wedges. Serves 4.